The Flight of the Swans team has arrived in Holland where they are being supported by paramotorist Pim Leemreise. Along with planning the route, Pim has also been helping to set up press and media coverage. Q Pim Leemreise, what was your first reaction when you heard about the plan to fly the Bewick’s swan’s whole migration route from Arctic Russia to the UK? Secondly, I saw this as a great opportunity for Sacha to fly the Bewick’s swan’s western flyway and scan the route for any problems the birds might encounter during their migration to the UK. It also offers the opportunity to focus attention on these problems and hopefully encourage people along the flyway to do more to help protect the swans and the wetland areas they need to survive. Q Why have you offered to support Flight of the Swans project? I’m a professional nature conservationist and I have been working with birds for 30 years. So, I know a bit about the decline in numbers of European breeding bird species. I’m also a paramotorist, so I understand about flying in the EU with a paramotor and if I don’t know something, through my network of paramotor friends, I know who to ask. Q This project highlights how important it is for countries right across Europe and Russia to collaborate. How do you think the paramotor flight along with the Bewick’s migration will help get the attention of the people of Holland? In Holland, we know about the importance of the western flyway, in particular for waders and waterfowl, so it’s not a new message. But it is an important message that we need to keep repeating. Q What are the challenges of flying in your country? 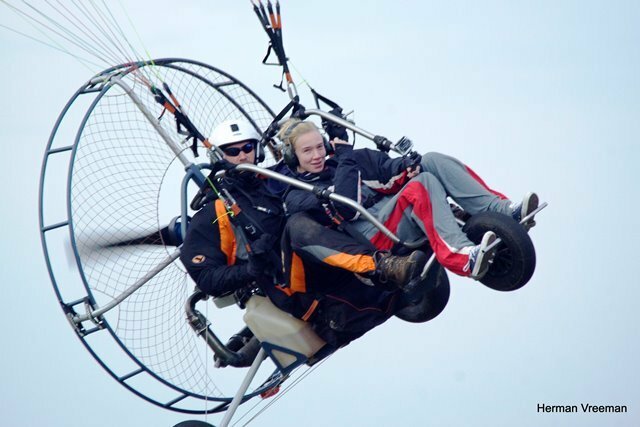 In comparison with the other countries, Holland is easy to fly in with a paramotor. There are lots of green meadows that are flat and easily accessible from paved roads. Q What kinds of landscapes might we cross? There are mainly two types of landscapes in Holland. In the north it is practically all meadows and grasslands with a lot of lakes and canals. The Lauwersmeer area in the north is an area of great natural beauty. The west and south-west is more or less the same, with a higher population density and with more villages and houses. In the middle of Holland, we have the Randmeren, which is a great recreational place, full of nature. It’s an area of lakes separated by low-lying land or polders, some of which date back to around 1000ad. We might pass over Veluwe as well, which is our largest wooded area. Here you’ll also find Lake Veluwe, a large, but rather narrow and shallow lake, popular with birds and tourists alike. And Flevoland, which has many nature reserves. This is the Netherland’s youngest province and has been almost completely formed through land reclamation in the 20th Century. I’m looking forward to meeting the crew in November when they arrive in Holland and introducing the Flight of the Swans expedition to the Dutch. I hope to get some attention from National TV and radio stations to help spread the very important message of nature conservation.